The Old Fashioned cocktail is a true classic which almost everybody knows. Normally this cocktail is made of bourbon, Angostura bitters, some water and a sugar cube. Some variants also use simple syrup, but I like the sugar cubes since they are the classic sweetening agent. Many cocktail addicts have the opinion that one can read the quality of a bar when ordering an Old Fashioned. Because the drink is a pretty unpretentious one, one can see quite well if a bartender is familiar with the matter or not. There is a very nice video of Chris McMillian (which unfortunately not really offers a contemporary video quality) on the Old Fashioned. In the 19th century, the name “Old Fashioneds” has rather become established as a generic name for cocktails, which consisted of alcohol, bitters and sugar. The popularity of such a mixture certainly grew due to the prevalence of rather poorly produced alcohol back in those days. 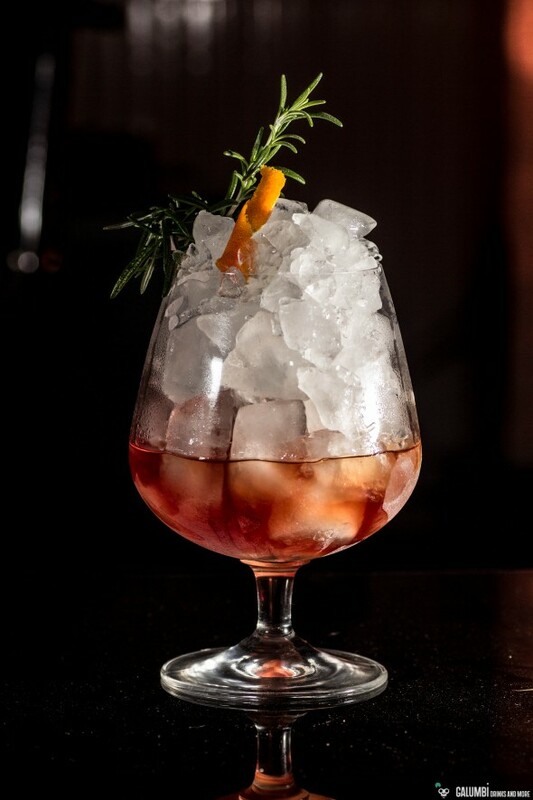 The New Fashioned is a modern interpretation of the Old Fashioneds, in which the sugar cube has been replaced with syrup and which comes up with additional rosemary flavors. However, no regular syrup is used but fig syrup. Fig syrup is not necessarily available in every supermarket (see below) and it is worthwhile to produce it yourself. A recipe, for example, can be found here. I came upon the New Fashioned by the book “Cocktailian – Das Handbuch der Bar” by Helmut Adam, Jens Hasenbein and Bastian Heuser. I really like it, especially the figs and rosemary combination produces a very interesting flavor profile that actually has a Mediterranean character. Because like in an Old Fashioned the Bourbon plays a very important role in the drink, you should rely on a rather solid bourbon of good quality. For example a Woodford Reserve, which I always like to use, or the 12-year-old Elijah Craig. Preparation: Carefully press the sprig of rosemary with the muddler inside of the glass. Then add the remaining ingredients and fill with ice cubes. Stir for 30 seconds then remove the sprig. Buying Sources: If you’re lucky you can find fig syrup in well-assorted supermarkets or health food stores. Angostura Bitters should also be available in larger supermarkets. The Bourbon brands I’ve suggested for usage in this drink can be found in specialized liqueur stores, probably also in well-assorted supermarkets or you can simply order them via the internet, for example here respectively here. This entry was tagged Angostura, Bourbon, fig syrup, rosemary.